Sony's business division is currently very transparent. 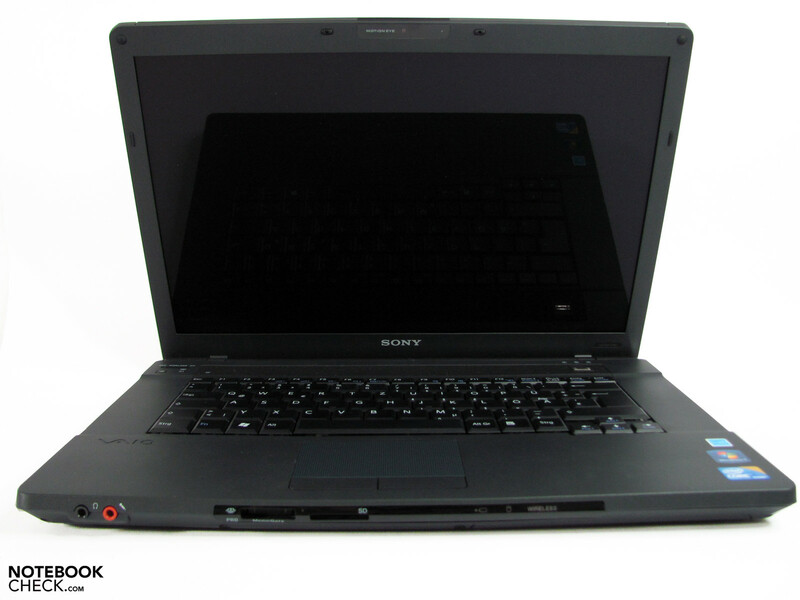 Whilst the models of the S, X and Z series found in the business field also are sold as consumer alternatives by Sony, the B family tested here is only found among Sony's business notebooks. We find many useful interfaces, like a docking port and a Trusted Platform Module, aligned for the business customer field, but have to forgo on dedicated graphics power in return. 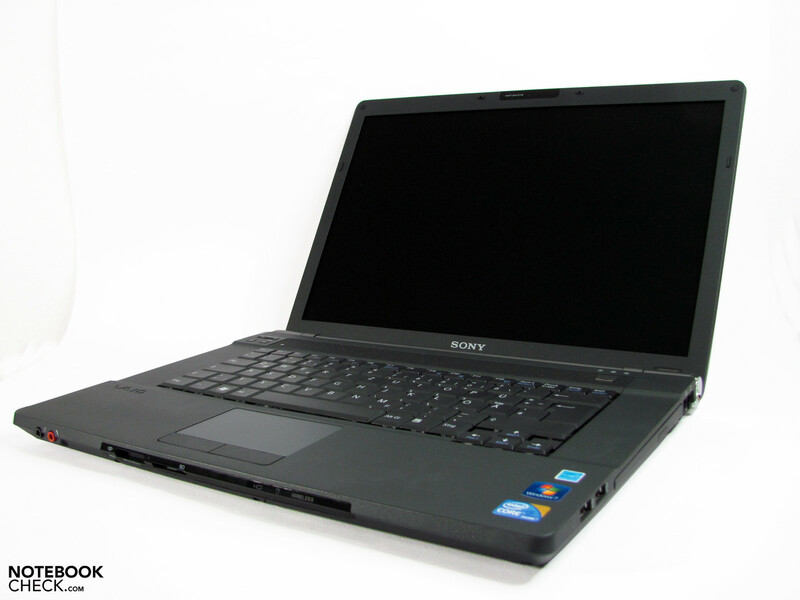 Sony's Vaio VPC-B22 notebook is currently available in two pre-configured alternatives that mainly differ in CPU, hard disk capacity and display. 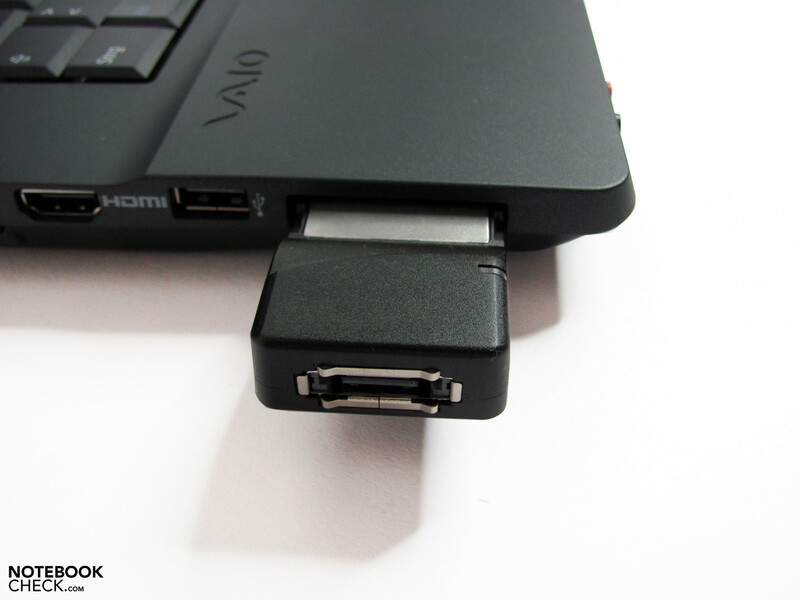 A configuration with Vaio by you, as we know it from other series, isn't possible. 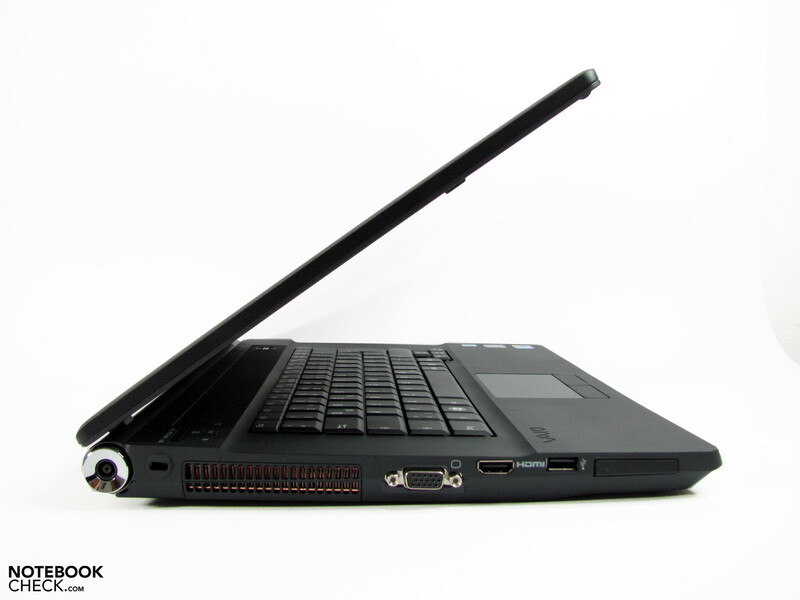 We have the "top model" with a Core i5-520M, a 500 GB hard disk and an AR-coated WXGA+ in review. The price is around 970.00 euro and thus well over 200.00 euro more than the smaller alternative with a Core i3-330M, 320 GB hard disk and WXGA display. The entirely roughened surface in a discreet business gray pleases right away. 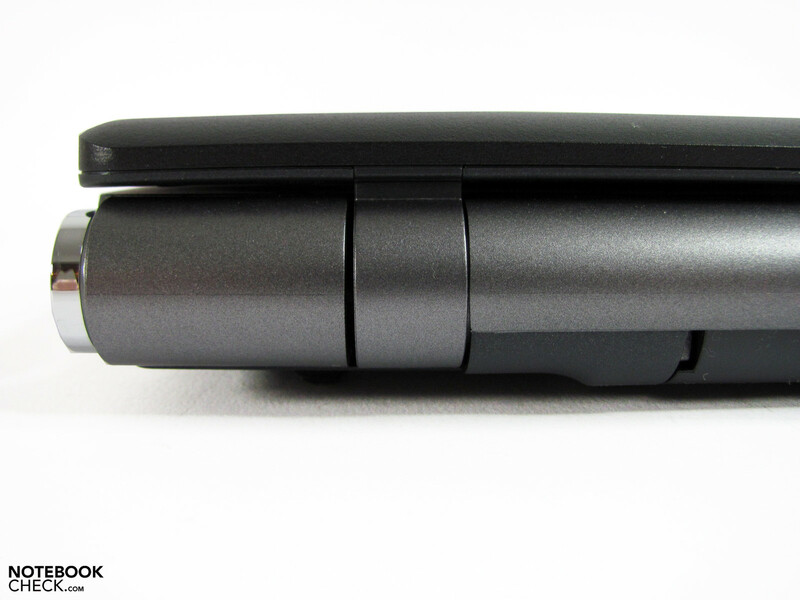 The case is a magnesium alloy. No high-gloss no matter where you look. 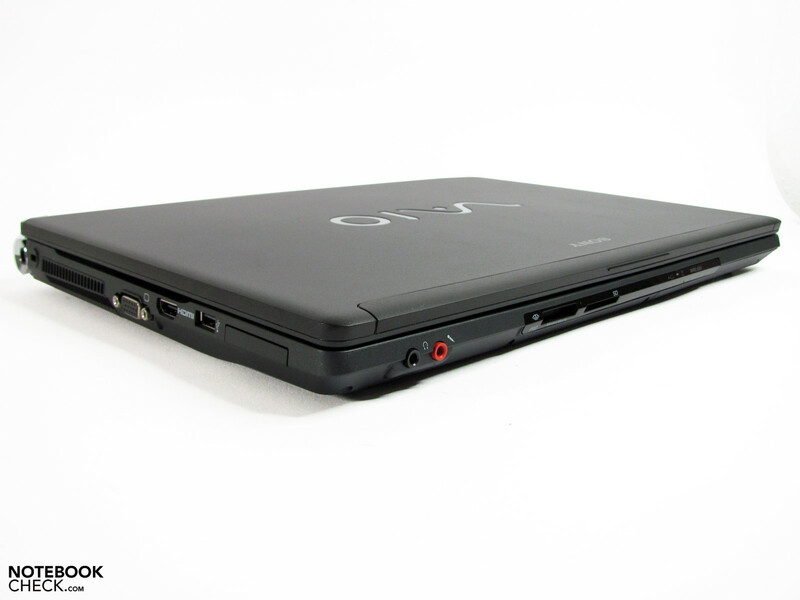 The Vaio has a good average for the 15" category with a weight of 2.49 kg and looks slim despite its record-breaking size of 37.7(h) x 262.4(b) x 266.8(d) mm. The shell makes a solid impression and proves to be rigid almost everywhere. Merely the area above the optical drive can be pressed in a bit. Even the battery fits tight in opposition to many other past Sony models. 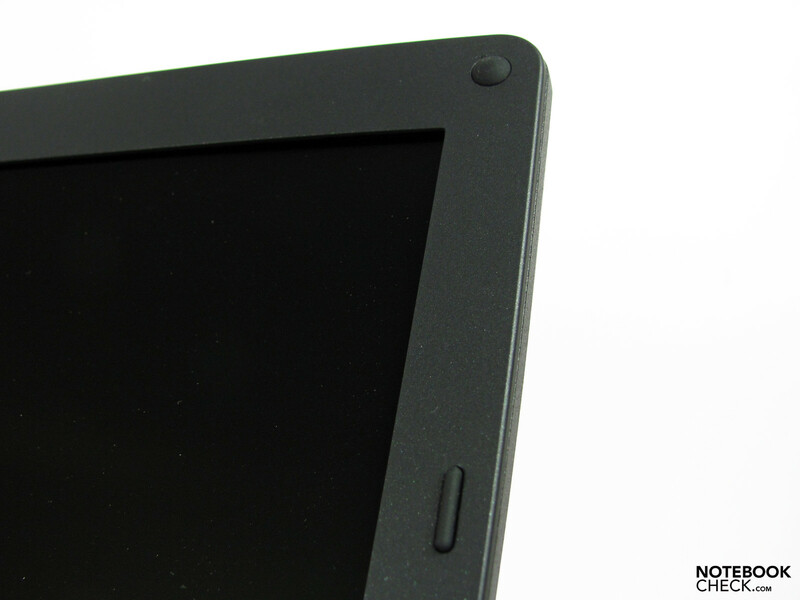 The display can hardly be twisted and the hinges have a tight grip on the display. So tight that you can't open it single-handedly. Then again, this has the advantage that a separate display latch can be omitted without having a bad conscience. We find several openings for accessing the RAM and hard disk on the bottom tray. Too bad: The hard disk cover is only fixed with one screw and wobbles. Adversely, there is a foot just on this lid, which results in a clattering noise every time the notebook is placed somewhere. 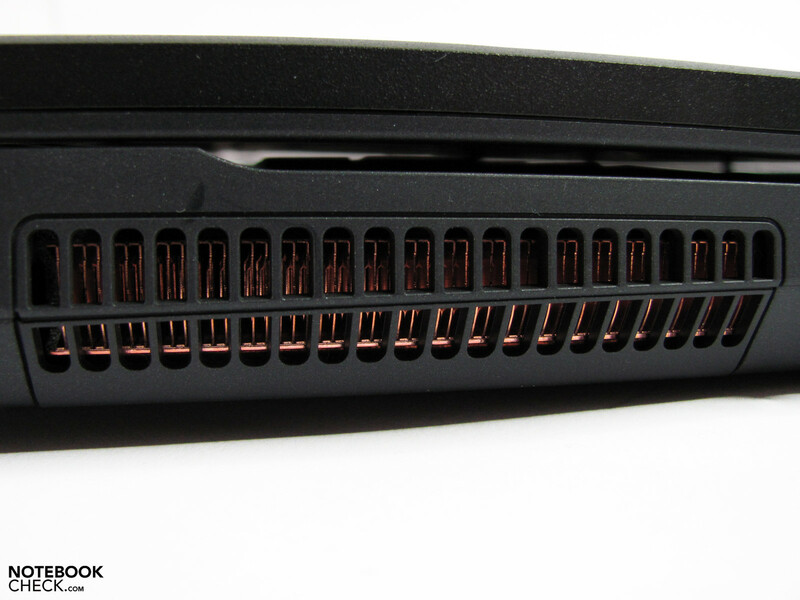 The docking interface is found hidden under a slider between the RAM slots and battery. 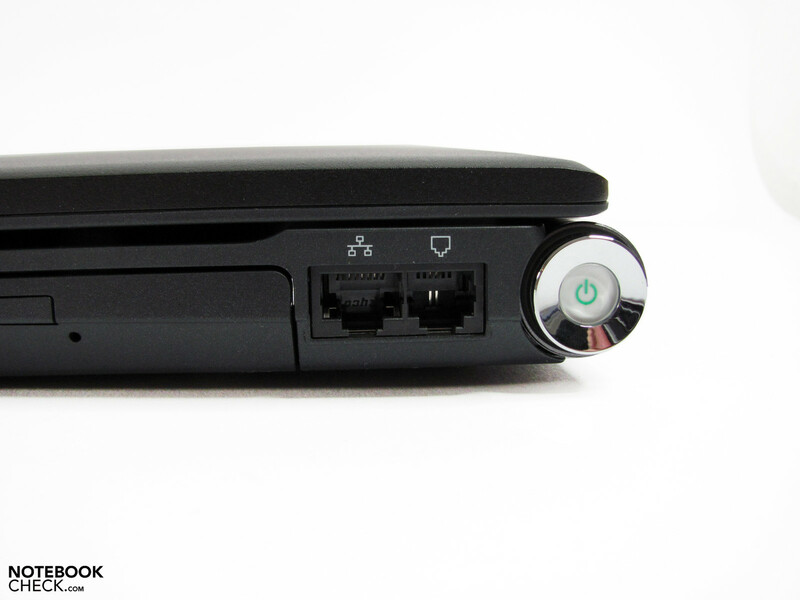 A hardware switch for WLAN and Bluetooth, a mute button for the loudspeakers and a freely assignable function button (S1) are found above the keyboard's left side. We find the fingerprint reader placed unusually on the right. The loudspeaker bar is between that. 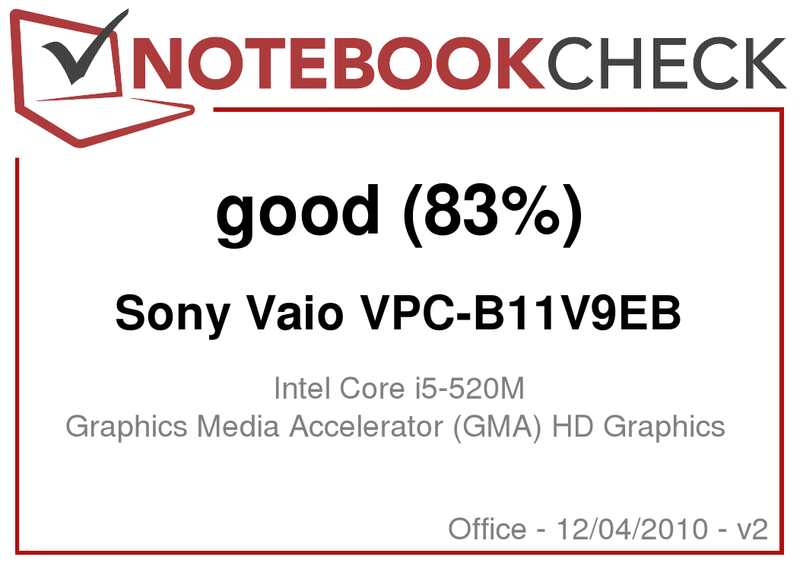 The Vaio business notebook has an overall only average connectivity. 3 USB 2.0s, gigabit LAN and a HDMI out for connecting digital monitors cover most of the basic needs. 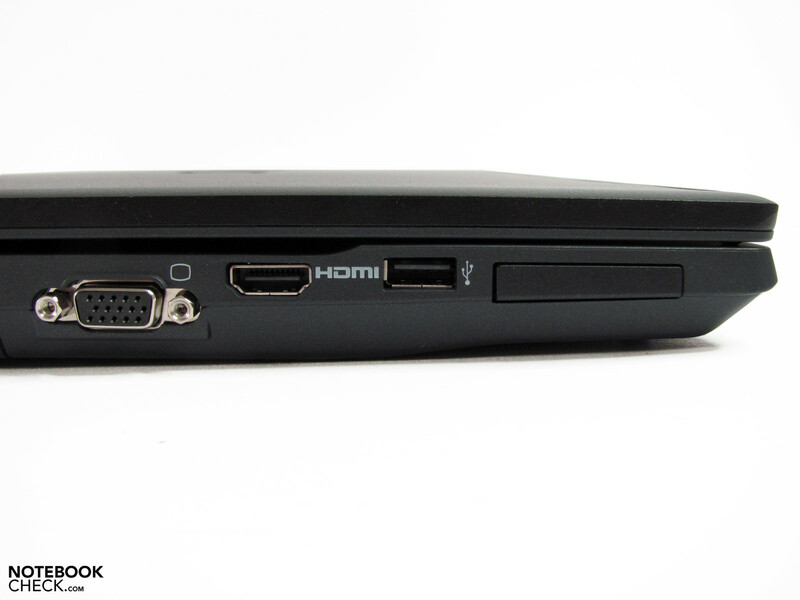 Audio and video can be transmitted to the respective display via HDMI. 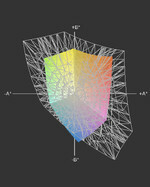 However, the maximum resolution is limited to 1920x1080 pixels (1080p). A DisplayPort might have been a more appropriate alternative in a business device. Additional interfaces can be upgraded via the ExpressCard/34 expansion. 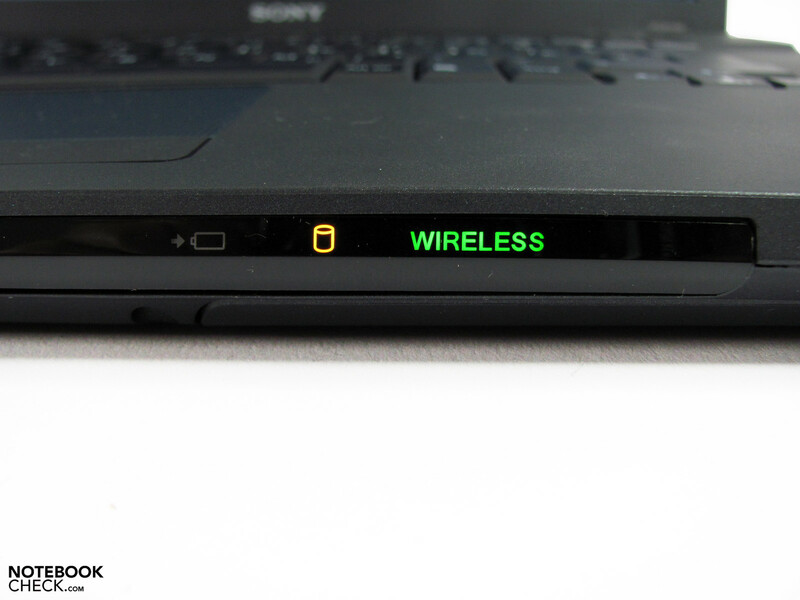 A connection can be made to external devices wirelessly via WLAN 802.11 a/b/g/n or Bluetooth 2.1+EDR. An HSPA modem (UMTS) is currently not available. Thus, you'll have to use external extensions, such as USB sticks or ExpressCards, to be able to stay in contact with the office on the go. Quite contrarily to Sony's earlier tradition, we can't find a Firewire interface (iLink/IEEE 1394a) any longer, either. Above that, it lacks all fast connection possibilities, like eSATA or USB 3.0. At least one of the two options would have been a feasible configuration feature even for the business field. 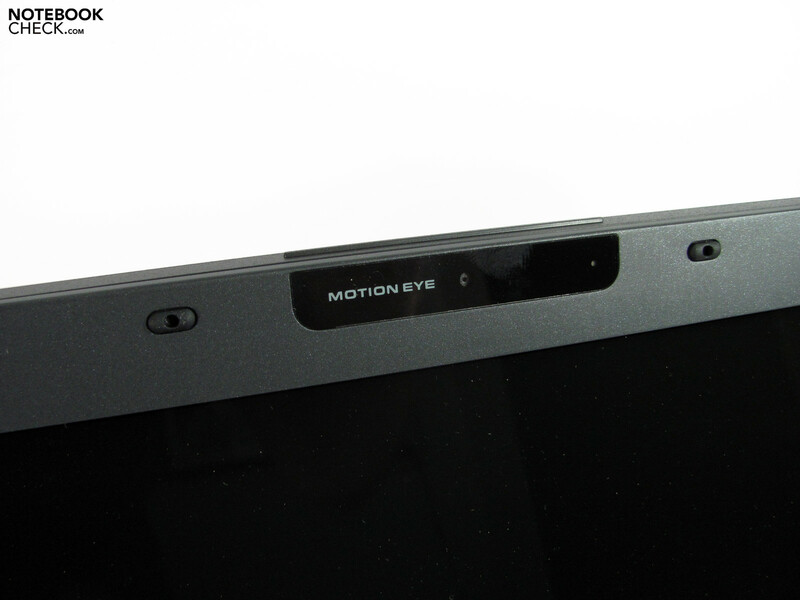 Nevertheless, just as important for the office is the docking port, an additional analog VGA monitor port for older displays and security features, such as Trusted Platform Module 1.2, fingerprint reader, hard disk shock protection and a Kensington lock. The B11 fortunately doesn't show any shortcomings here. The VGA connection bids a pleasantly good image at a resolution of 1280x1024. That is rare. The VGP-PRBZ1 (200.00 euro) already known from the BZ range is still used as the docking station. It has 4 USB 2.0s, a DVI-D, VGA and gigabit LAN, but here as well doesn't complement an alternative interface, except for DVI. In our opinion, the port distribution hasn't been well considered, either. Thus, the USB ports integrated on the right's far front are easy to reach, but obstruct especially righties who like to use a mouse when peripherals are connected. 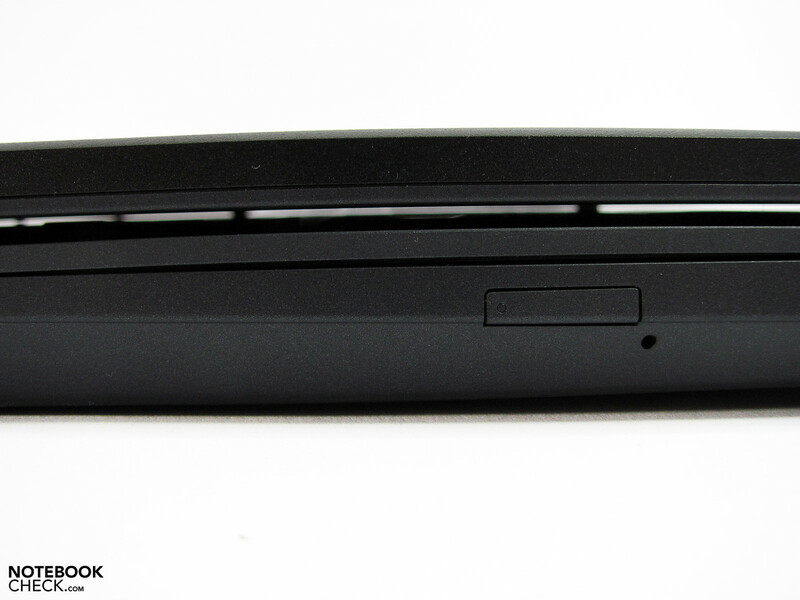 The display ports, usually fitted with unwieldy cables, and the often protruding ExpressCard expansions in the notebook's left front area can cause obstructions. This will naturally be assessed quite differently depending on the user and is also always dependent on the individual work situation. The audio sockets for headsets and the cardreaders adjacent to that, one for SD memory card and the other for Sony's memory sticks, are quite pleasing. 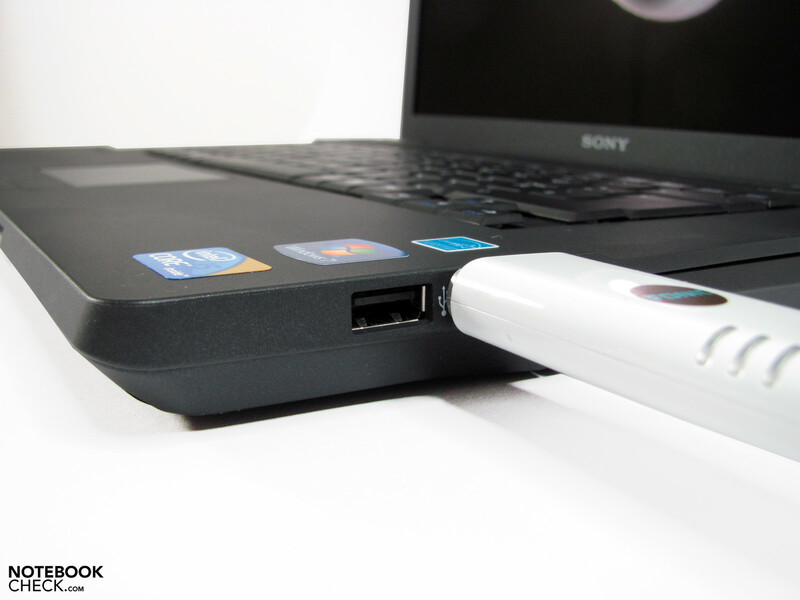 The USB ports' transfer rates are above average and reach up to 30.1 MB/s. The SD cardreader achieves 19.8 MB/s. Our test model is fitted with Windows 7 Professional in its 64 bit alternative, matching the target clientele. In addition, there is the possibility of downgrading to Windows XP with the included DVD, which primarily is a benefit for companies that haven't yet switched to a more current system. The other software equipment is quite meager and basically is limited to well-known 60 day trial versions. The times in which full Adobe products were found in the scope of delivery also seem to belong to the past. Many business users would like an additional number pad that makes it easier to input large number sequences. 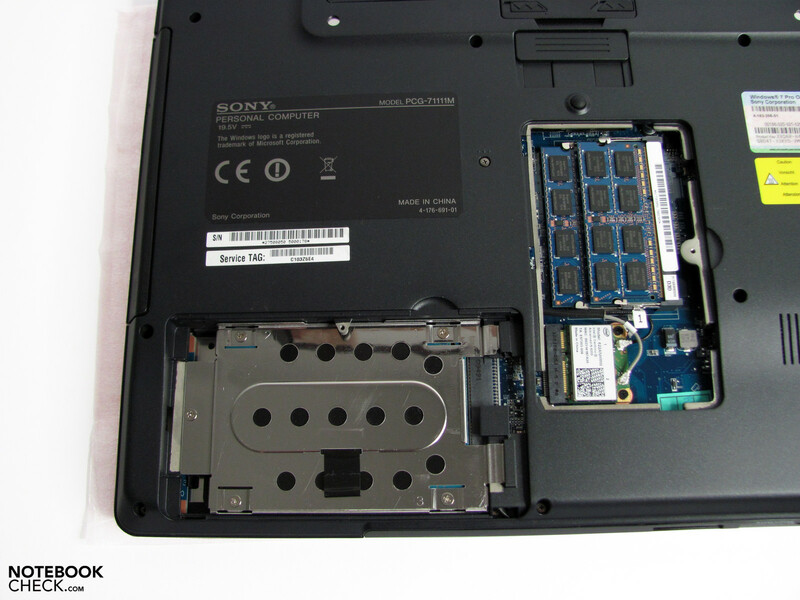 Sony doesn't comply with this wish in the Vaio VPC-B11 and only provides a standard layout. 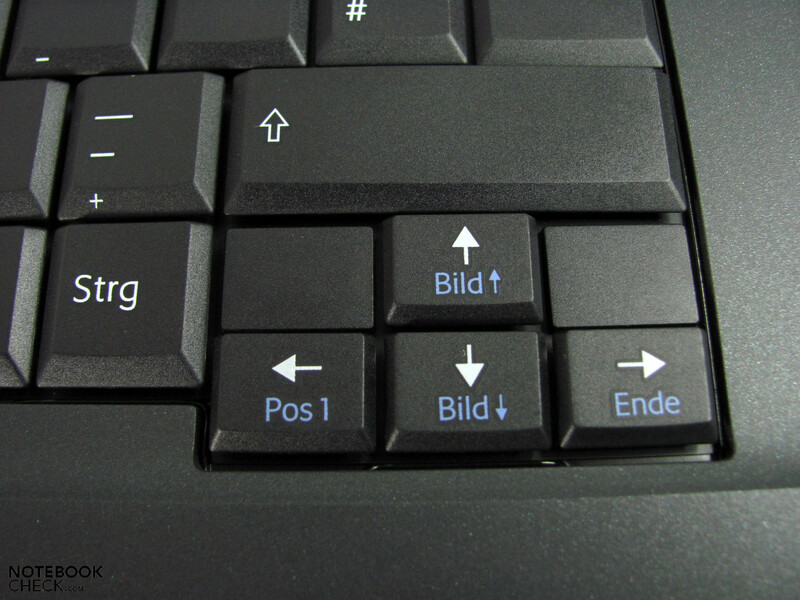 However, it comes with normal-sized keys, the usual layout and a few functions in the FN combination field. Frequently used keys, like shift, backspace, enter, tab and the arrows, are pleasantly sized. Although the keyboard can be pressed in, especially in the area of the optical drive, it supplies a good typing feel with suitable feedback for frequent typists. The lettering is contrast rich and allows the figures to be seen quite well even in unfavorable light conditions. 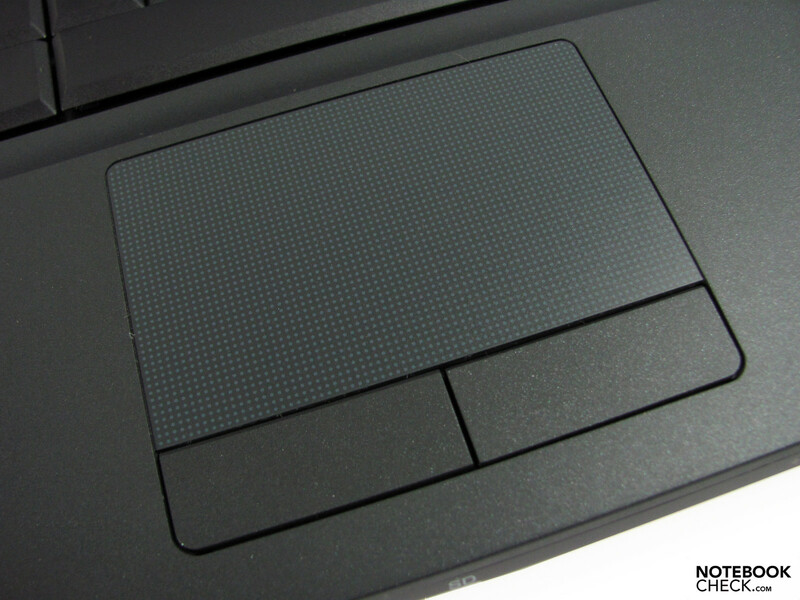 The touchpad has a pleasant size and gliding ability, but can't serve with multi-touch gestures. The input is recognized well and allows for an unproblematic control after a short accommodation period. The short-stroked touchpad keys respond just as well, but confirm clicks with a somewhat mechanical noise. 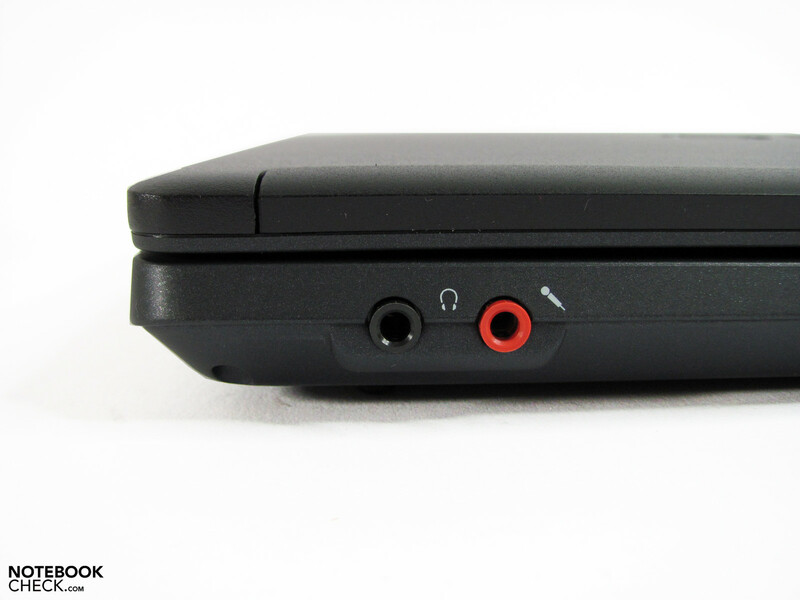 Sony doesn't offer alternative input options, such as trackpoints available from some competitors. Perhaps this is the reason why countless mice or even a Bluetooth keyboard with a separate number pad are found in Sony's accessory program as optional equipment, naturally for an additional charge. 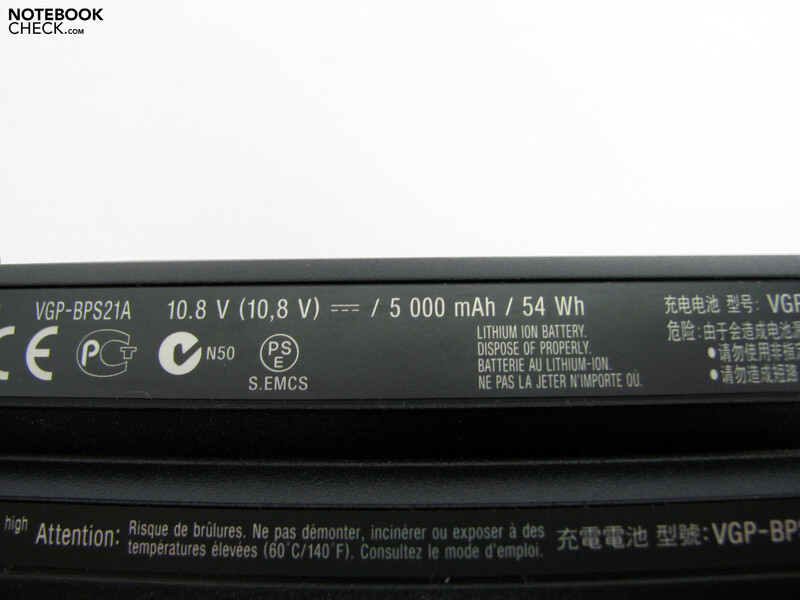 The used onyx black display with a 16:10 format in connection with modern LED backlight in the Vaio VPC-B11 presents an unusual rarity nowadays. Whilst 16:9 screens are used in almost all current releases, Sony uses, as already for the predecessor Vaio BZ, a WXGA+ resolution of 1440x900 pixels, which was formerly also hardly used in the 15" category. 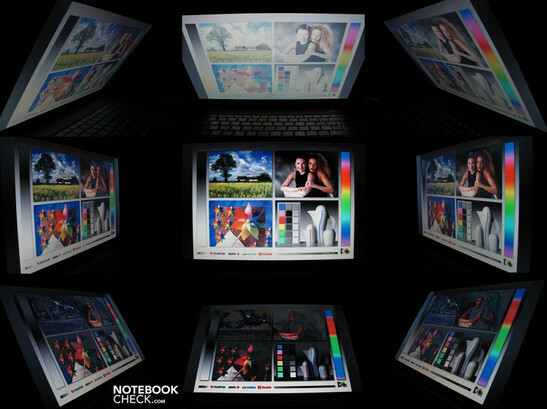 The dot density is in a balanced field with 110 dpi and offers a good ratio of image size and available display surface. Alternately, Sony offers a similar display with a WXGA resolution (1280x800) in the Vaio VPC-B11X9E. Merely 52% of the color space is covered. The latter application field is additionally impaired because the full brightness of about 250 cd/m2 isn't available in battery mode, but only a maximum brightness of 205 cd/m2 instead. 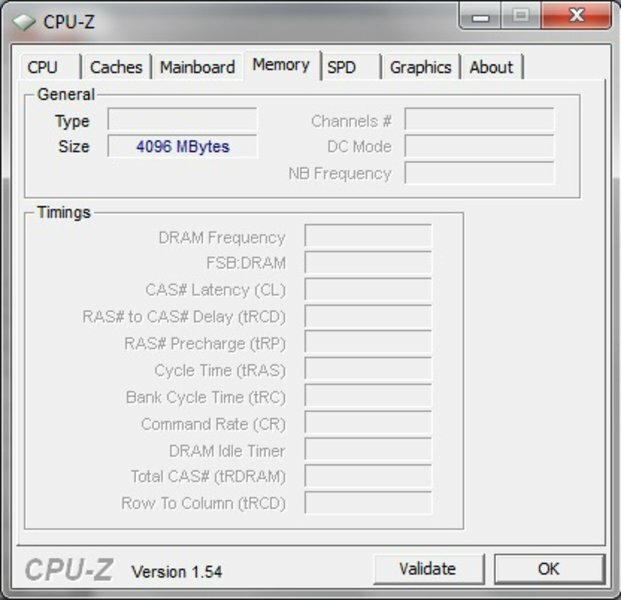 This setting can't be altered in the BIOS, as in some other notebooks. Otherwise, the brightness can be set to 12 cd/m2 up to the maximum brightness in 8 steps and is well distributed with 83%. Usually, level 6 grants an ergonomic brightness of about 160cd/m2. The brightness decrease toward the display's lower third can only be recognized on monochrome screen backgrounds during practical use. We find the low contrast ratio of 147:1 disappointing. There's nothing to be seen any longer from the previous advantage ascribed to glossy displays. White isn't really white and you also look for a saturated black in vain. Text documents rather appear to have been written on gray paper and dark movie scenes make a bleached impression. Even the colors are presented overall pallid and not very saturated. The color space only reaches 52% or the sRGB's color space and is thus on par with standard notebook displays. The screen is hardly suitable for image editing despite its comparatively higher resolution. The viewing angles stand out with a large horizontal stability, but suffer on the vertical plane of fast color inverting or bleaching, as so often. The Sony Vaio notebook, Sony Vaio VPC-B11V9E, is equipped with Intel's HM55 Express Chipset and has a fast Intel Core i5-520M CPU. It includes 2 physical cores, hyperthreading (4 threads due to 2 additional virtual cores) and turbo boost. The clock rate has the usual 2.4 GHz and can be increased up to 2.93 GHz by single thread applications. 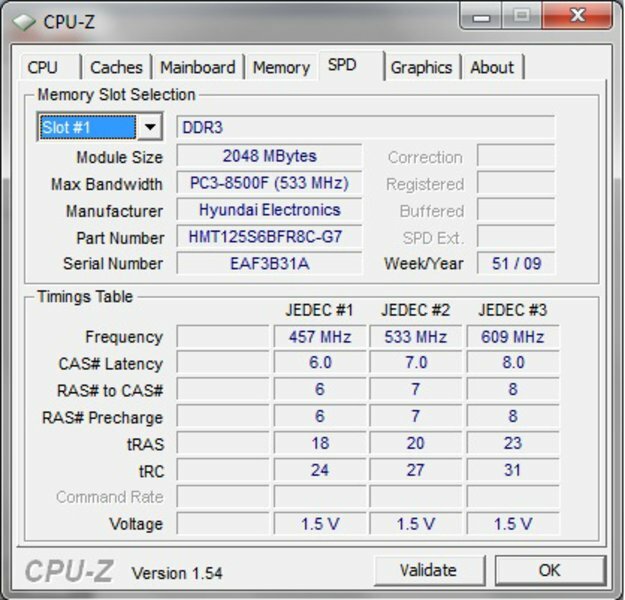 The memory controller and graphic core are also found in the processor case. 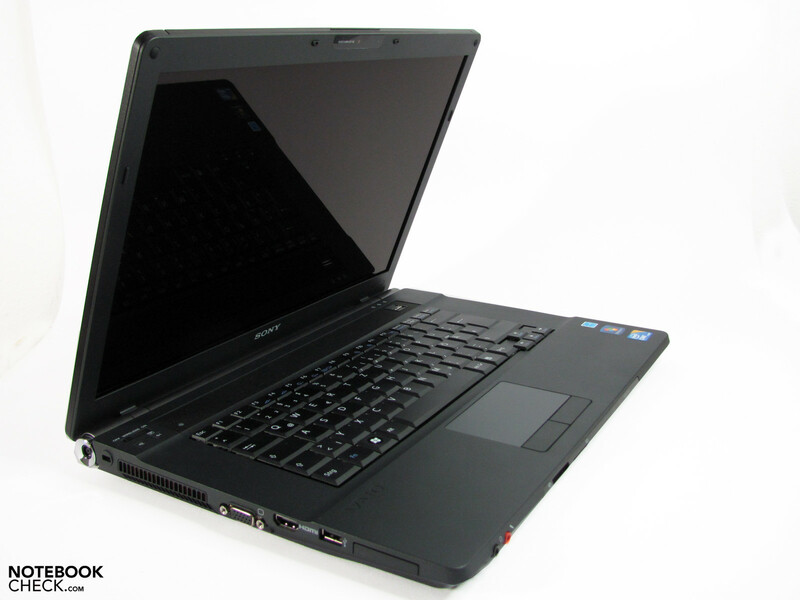 Our test model is equipped with a 4 GB DDR3 RAM and can accommodate a maximum of 8 GB (4 GB modules) in two slots. 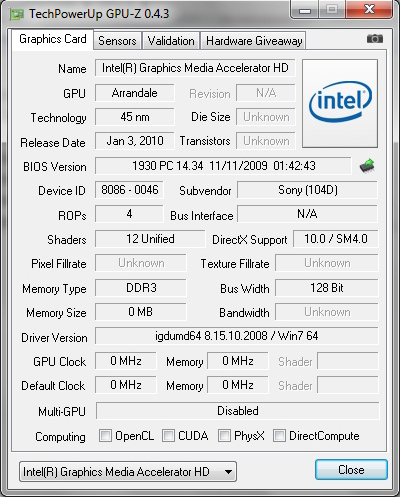 Intel's integrated HD Graphics shows itself responsible for graphical output, and can also use standard clock rates (500-766 MHz). 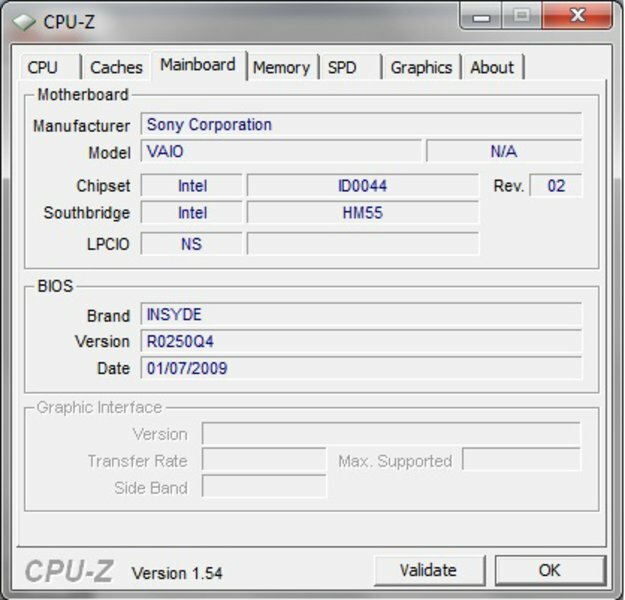 Booting from external devices, as well as Intel's Virtualization Technology and the Trusted Platform Module isn't enabled in the BIOS ex-factory. This however can be changed if wanted. 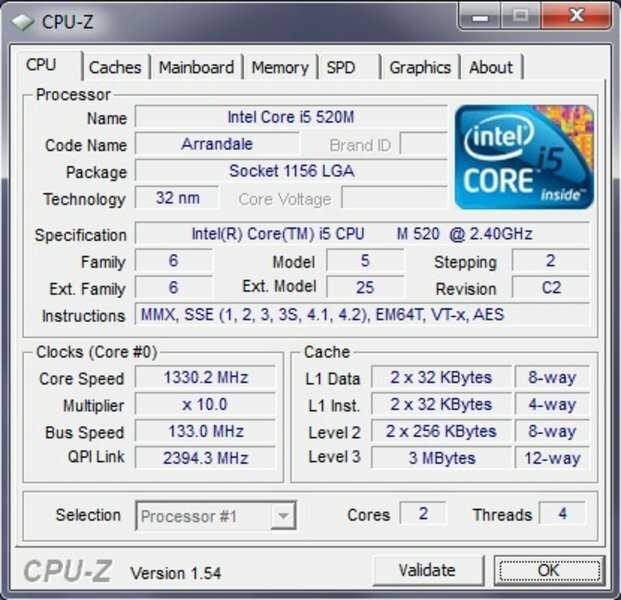 A highlight of our test system is the Intel Core i5 processor that provides a very good computing performance. This isn't only shown in the usual benchmark results, as in wPrime 1024 (599s), Cinebench R10 64bit multi-core (8049 points) or superpi 32m (899s), but also in our practical tests of video and MP3 converting. The Core i5-520M CPU converts MP3 files with a 33.4 time speed to AAC with iTunes and our 300 trailer in 1080p was reduced to an iPhone compatible format within 11 s. Both are top rates. 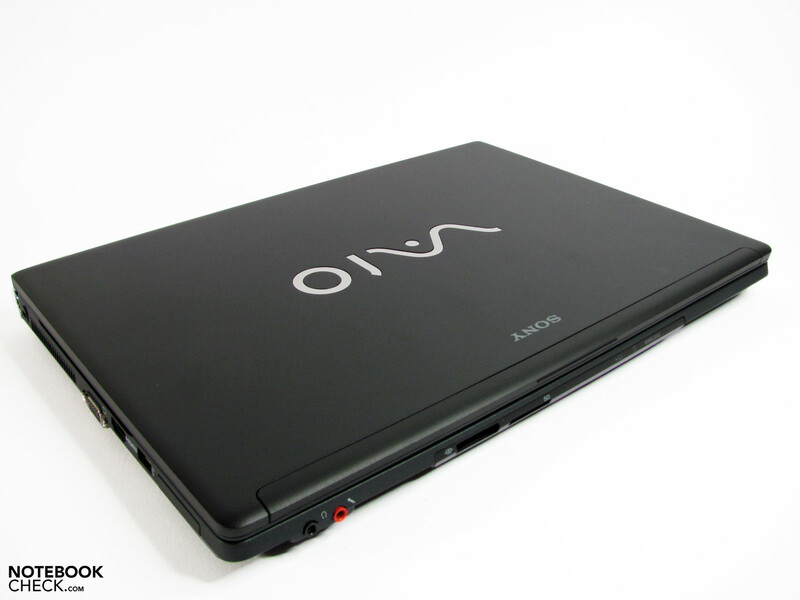 The Vaio isn't suitable for rendering the latest tracks or for complicated 3D calculations. Here, it lacks the performance for keeping up with dedicated graphic cards, despite the variable clock. Thus, the benchmark results only move along the lower performance scale with 332 points in 3DMark Vantage and 2169 points in OpenGL Shading Cinebench R10. Sony doesn't offer alternatives with a dedicated graphic chip, for instance from Nvidia or ATI, in its VPC-B series. We also checked our test device for synchronization errors that may be caused by latencies with the DPC Latency Checker tool. We noticed a maximum spike of 1069 µs that shouldn't lead to any adversities. We evaluate the application performance with the synthetic benchmark PCMark Vantage, as well as with sporadic practical tests via Photoshop Elements, Open Office and Skype. 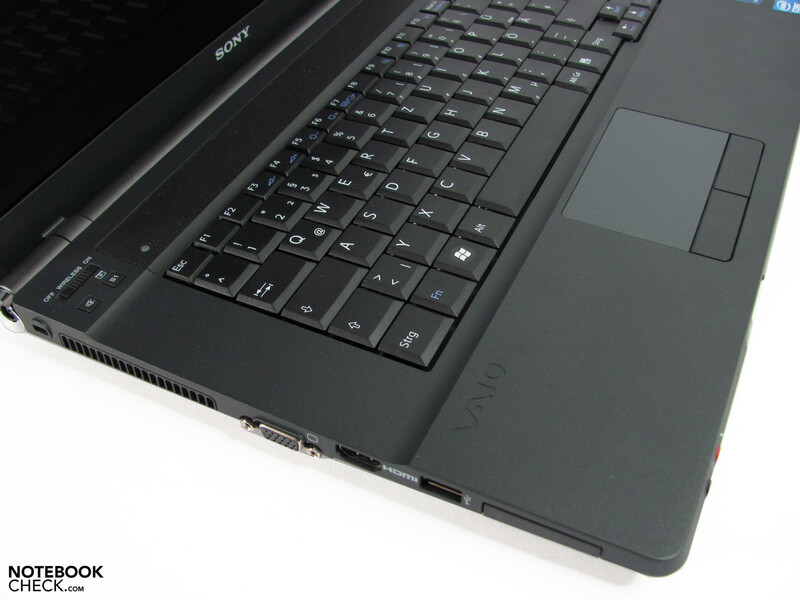 The Vaio VPC-B11 can score well in all fields, which is verified by the result of 6180 points in PCMark Vantage. A Toshiba hard disk is used. It supplies a high capacity with 500GB, but only average rates with not quite 60 MB/s. Despite the common rotation speed of 5400 rpm, the hard disk emits an almost as loud engine noise as is known of 7200 disks. Sony currently doesn't offer alternative hard disks options (apart from the 320 GB hard disk in the Vaio VPC-B11X9E), let alone SSDs for its business Vaio. But just such an option could increase the system performance significantly. The noise emissions can generally be described as inconspicuous and usually only attract attention in quiet surroundings with 31.0 dB(A) to 31.9 dB(A). Particularly the discreet fan noise without unpleasant frequencies is pleasing. A further noise reduction could be achieved with SSDs or very quiet, common hard disks, as Toshiba's HD engine noise is very audible, as already mentioned. Not as nice is the irregular, pulsating fan that is observed especially in the energy profile, high performance and then especially without load. A short turning up, then a speed reduction, and so on. This phenomenon wasn't really reproducible, but was repeated in irregular intervals. The system noise increases under load to a clearly audible 36 to 38 dB(A), but usually remains within a tolerable, not unpleasant, range. A temperature development is almost non-existent and absolutely within a green field even under continuous load with a maximum of 36°C selectively. Thus, a use on the lap, or on hot summer days, shouldn't be a problem. 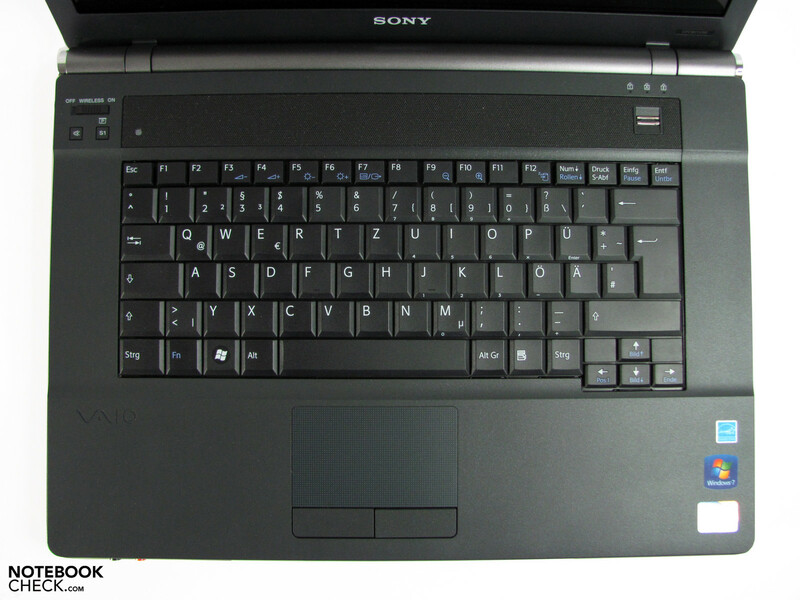 Sony has placed the loudspeakers above the keyboard and they offer a sufficient quality. They have a large volume range and can be used well even for presentation with several participants. Audiophile finesse shouldn't be expected though. The sound characteristic is only suitable for basic tasks as they are very treble-prone with little midranges and basses. Surround cinema or party sound at a company party are thus impossible. Headphones or USB loudspeakers are recommendable as an alternative to the notebook case. Our subject's power consumption measured at the mains ranges from 14.2 watts in idle up to 64.4 watts under full load. The rates will likely be in a range of about 20 watts at normal use, depending on the energy saving profile and utilization. 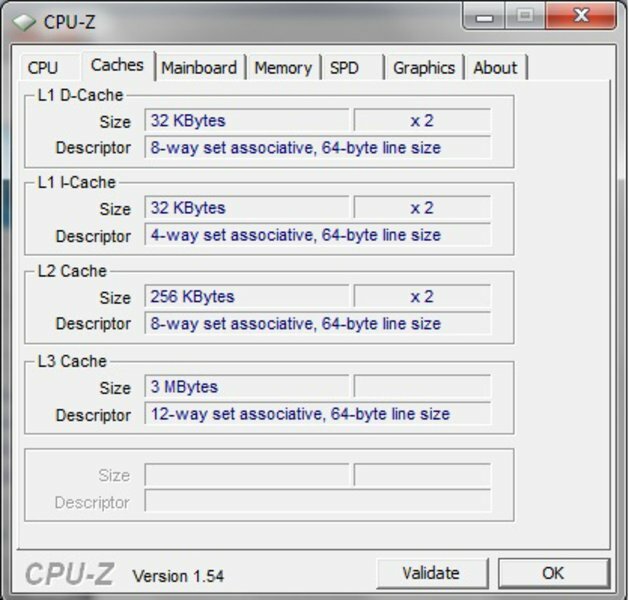 The consumption increases significantly when computing intensive applications, such as converting, are executed. Those are average rates that are quite reasonable in relation to the computing performance. 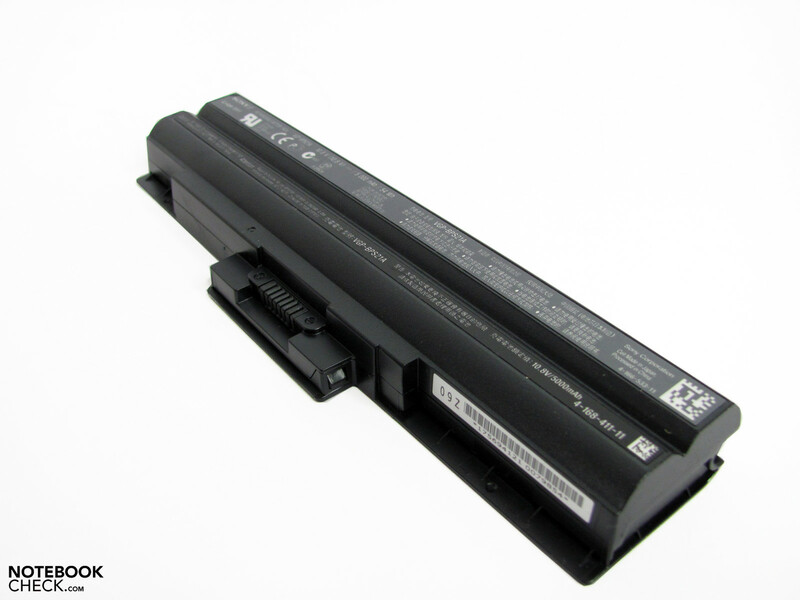 In order to satisfy this power requirement in battery mode, Sony equips the business Vaio with a 6 cell battery that has a capacity of 54 watts. Furthermore, Sony offers two batteries in their accessories program. The VGP-BPL21 (9 cell, 81 Wh, 200.00 euro) and the VGP-BPS21A (6 cell, 54 Wh, 160.00 euro), which also corresponds to the included model. Sony apparently uses a few additional energy savings tricks in battery mode, as many other manufacturers now do, which allow a significantly reduced power consumption in opposition to mains operation. We were able to surf via WLAN for 232 minutes (in terms of figures 13.9 watts) and watch a DVD movie for 181 minutes (in terms of figures 18 watts) at an agreeable brightness (ca. 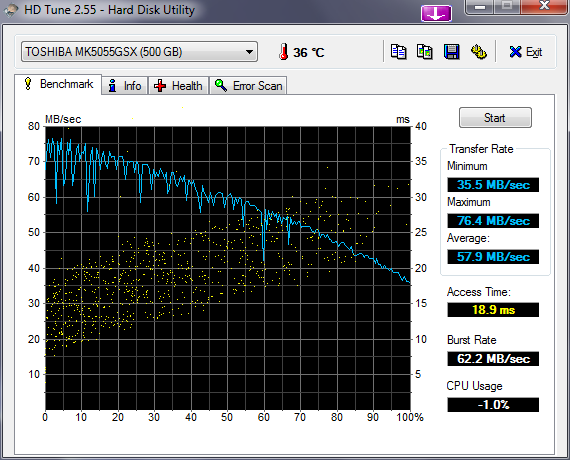 180 cd/m2), if you abide a rest capacity of 3%. Therefore, there's nothing standing in the way of an internet evening or movie night in this regard. Even business presentations are possible within this time period, without having to end prematurely with a black screen The runtime only decreases insignificantly by 8-12 minutes when connected to an external display via VGA (comparable to a video projector). We achieved a mains independency of 340 min. (ca. 10 watts in terms of figures) in the BatteryEater Reader's test (longest runtime with disabled consumers, dimmed display). The Vaio was exhausted after 81 min. (ca. 43 watts in terms of figures) in the BatteryEater Classic test (shortest runtime, all consumers on, maximum display brightness). Sony makes too many slip-ups to really present a danger for the established "top dogs" like Lenovo, Dell or HP. Whilst the lack of a number pad and the port distribution are quite individually rated characteristics, the omission of a fast peripheral interface, as well as the contrast weak and additionally reflective display are dissatisfying. An outdoor use is also made difficult by the limited brightness in battery mode. Sony slips-up unnecessarily in terms of workmanship with a clattery cover on the bottom tray due to construction and a second time with the not always even gaps. 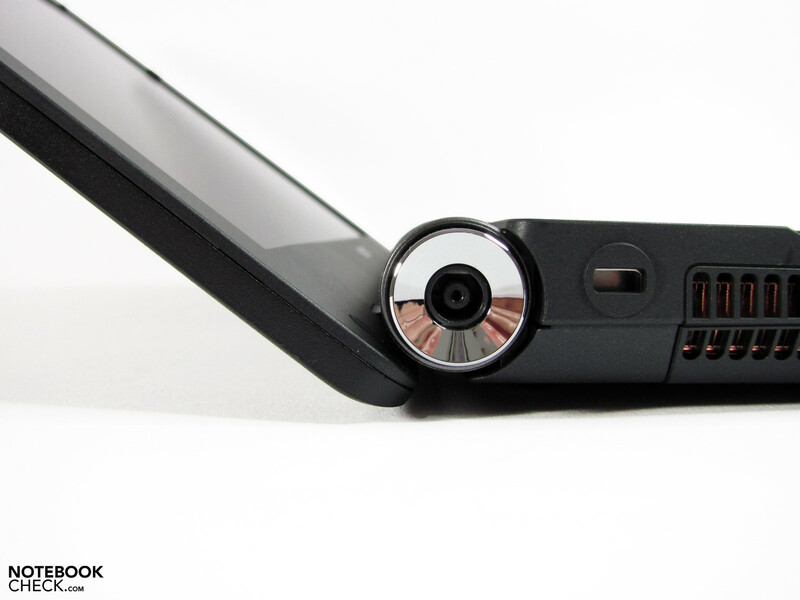 The optional docking station doesn't supply any additional connection types, but only covers the comfort aspect in the area of handling. The only things left are the very good application and processor performance, as well as the elegant design. Ultimately, the customer has to decide if these can compensate the one or other drawback. Sony has a hard time competing against the established business competitors. LAN and modem have been placed nice and far back. 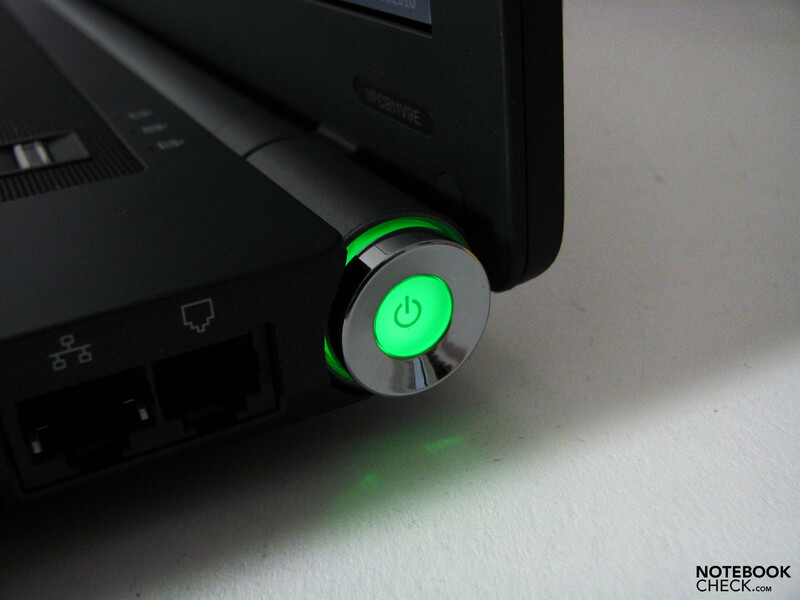 The power button's position, design and light have been well considered. Display lid and base unit with a gap, could be penetrated by foreign objects. 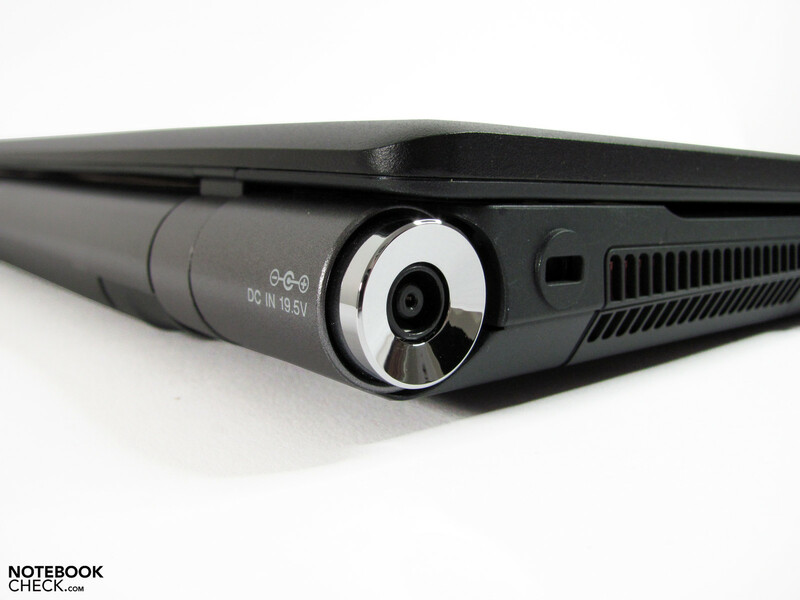 Webcam "only" has a 0.3 megapixel resolution. Several rubber stoppers keep the display away from the keyboard. Broad USB sticks could cover the neighboring port. eSATA can only be added as an ExpressCard expansion by you. The hard disk and RAM bar are easy to access. The small and light battery doesn't quite need 4 hours to recharge. The USB ports aren't placed conflict free on the right. ...and isn't really convincing with the otherwise low contrasts and pallid colors. In return, the elegant and rather slim looking design with quite a few design elements is appealing. The display's opening angle is restricted, but is sufficient for most application fields. The separate WLAN switch is in an easy to reach place. The copper cooling fins flash through the air vents. The cylindrical design at the rear is already known from other Vaios. Crowded connections at the far front. 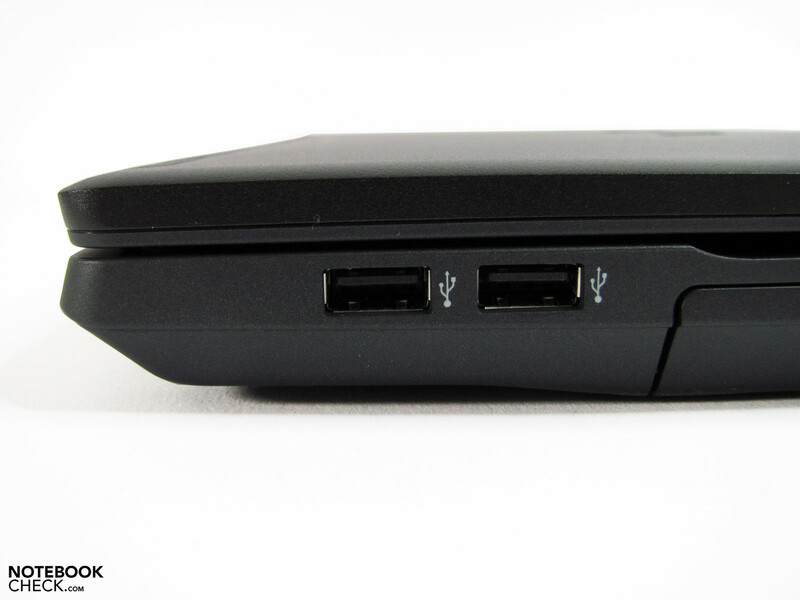 The Vaio VPC-B can last for quite a long time despite an average capacity. The design and the very good application performance. 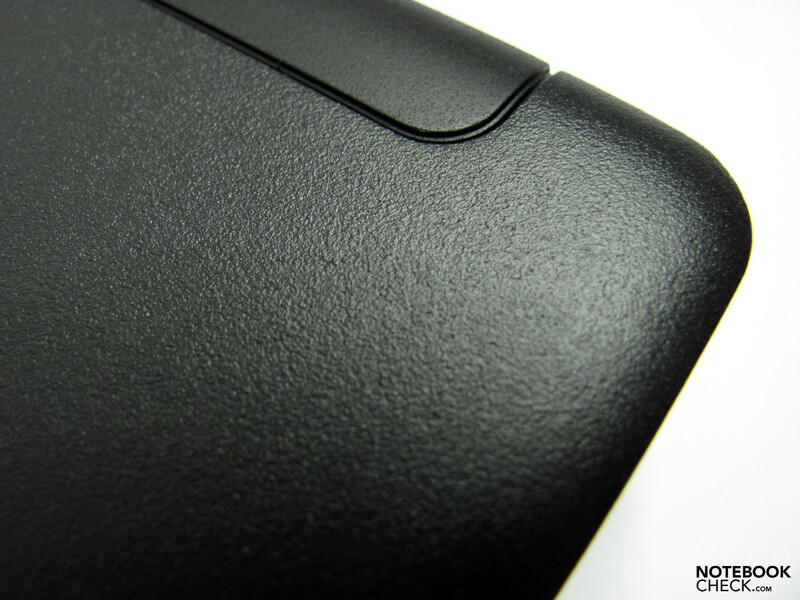 A more precise workmanship and a good display with an AR-coated surface and feasible contrasts. A few more interfaces and optional UMTS would also look good on the business book. That Sony has been able to reduce the power consumption in battery mode noticeably. Dell's Latitude E6510, Lenovo's T510, HP's Probook 6540b, Toshiba'S Tecra S11 and A11.